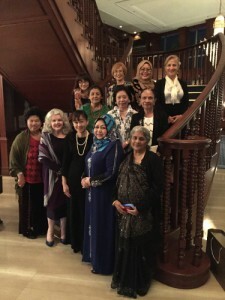 It is impossible to overstate the passion my hosts of Ikebana International Kuala Lumpur Chapter have for Ikebana nor how wonderfully welcoming they they were. From first meeting and having tea with the Committee of I.I. KL Chapter on arrival, I was made to feel very special. Malays, Japanese, Indian and an Iranian, all living in this wonderful city have built enduring and delightful friendships through flowers. They had organised everything. A visit to a flower wholesaler to order some of the materials for both my demonstration and the workshop. The off to the Japanese Ambassadors’ residence, where the Ambassadors wife, Mrs Miyagawa, invited me to chose any materials I wished from their wonderful garden and any vases from their extensive collection. The exhibition will had around 60 exhibitors; my demonstration an audience of perhaps two hundred and my workshop 30 to 40. I am so grateful to have the help of so many people to prepare and my good friend and fellow Ikenobo professor, Sachiyo, who has travelled from Japan to join in the fun. I have so much more to tell and photos to show so will be getting a post-even page and gallery up soon.